Nawal Habib wakes to find herself in prison after an explosion where she was searching for her son. Terrified of terrorist connections, she remains silent as authorities search for him while praying he hadn't been killed in the blast. When they contact the family she left behind she's forced to confront the past she fled as a teen and later reinventing herself as a devout Muslim. When her brother, now a priest, hands her a book written by their grandfather, James Kelly, that had been hidden in their father's attic for decades, Habib becomes absorbed in the world her grandparents inhabited and draws parallels to her own. An autobiography, the story Habib reads unveils how James Kelly was hired to search for her grandmother, Gladys Sage, who had disappeared from the Northern Ontario backwoods, leaving behind the body of her stepfather. Following her to New York, James discovers her involved in a radical political movement and goes undercover among them. Nawal Habib learns of her grandmother's turmoil as she suffers through her own as well as her grandfather's obsession, not only with Gladys, but with easy money, drink and woman and family secrets buried for generations. Gladdy's Wake is a novel about radical politics, religion, prohibition, terrorism, and above all else, love and family. Sadly, I was ill much of the time I read this book and will have to go back and re-read it at some point to catch more of the symbolism I'm sure I missed and also because now that I know how it ends, I must reread it to follow through it again with that knowledge. I don't remember the last book I've said this about. Upon finishing this unforgettable novel, I read the epilogue ten times as I processed the information and shook my head as I ran over the story and the epilogue's revelations and meaning. I actually sat for several minutes, book in hand, saying "Wow. Oh wow." over and over again. And where I usually pick up the next book in my pile, I couldn't that night. I must admit this novel started slow for me (could have been the cold), and I wasn't sure about the 'second book' at first. But I plugged away and grew to love the historical story and in the end I was blown away by the emotional sucker punch this book delivered, how many times I gasped out loud and the tears I shed. I've been dying for Kathryn to read this one so I can have someone to talk to about it. That's how much I was fascinated by it in the end. And seeing how big her TBR pile is, I just passed it to my dad to read so I can talk about it with someone. Part mystery, part love story and part family drama with a hint of Boardwalk Empire, this novel was gut wrenching, shocking, and intensely compelling. I couldn't help but wonder what was going to happen each time I had to walk away. There were twists and turns I wasn't expecting and I was surprised at the overall emotional impact it had on me considering I wasn't as attached to the present day story. If I had been, I might have been left shouting at passers-by on the street to read this book. I did love the story of James and Gladys more than the present day story and I'm having a hard time putting my finger on why. I think if I felt more connected to Nawal's character I would have enjoyed it more. At times I found her thoughts disjointed which I think distracted me or maybe because her story was largely narrative through memories and worries about her son in present day without a lot of interaction with others, I just couldn't feel as connected as I wanted, but Gladdy's tale took up much of this story and in the end I wasn't disappointed. Please, people, read this book and tell me what you think of it! Everyone should read this book. I still can't stop thinking about it and can't wait to see what else B.K. Anderson has in store for us. I’m still thinking about the plot in this story and trying to make sure I’ve actually got the whole thing cleared up and sorted away neatly. Unfortunately I don’t think this is actually going to tidy away quite as nicely as I would like due to a tiny epilogue at the end of the novel that I don’t want anyone to miss- it’s really an epilogue though and not to be read until the end! I found this book fascinating from the beginning which I think means that Lydia’s feeling of a slow start must have been due to her cold as we generally tend to agree on speed of addiction! I got completely sucked into the main storyline immediately (which for me was the story of Gladdy and James) and even was pulled back happily to the present day plot of Nawa, at first. However as the novel progressed I did lose interest a bit in Nawal which unfortunately was because I didn’t warm to her- I think perhaps we could have benefited from some more information about her past with her parents and brother. It would have given us something to hold on to when we’re starting to question her involvement in the terrorist attacks later on. James and Gladdy were firmly in my mind and heart as I read the story of their meeting, falling apart and coming back together. I liked and disliked each of them intently at various points in their story but never thought that either of them should be given up. The love stories intermingled really well with the political and religious stories and I admired greatly the way this was written. 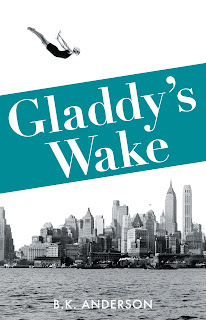 I was also surprised many times reading Gladdy’s wake which I love! Like I said at the start I’m still trying to wrap my head around the epilogue and like Lydia I will also be reading this one again with a new set of eyes in the future. Thank you to Second Story Press for providing our review copy. All opinions are our own. I couldn't agree more. I read this book last week and couldn't put it down. The historical narrative rings so true. I really felt as if I was walking the streets with Gladys and James in turn of the century New York. Make sure to dive into this one.